That's some crazy contrast. It's not often you see flowers in this light, moody good Dave. Now this one I really do love... This would be great as a huge painting in a "sparsley" decorated room... maybe black leather furniture, and nothing with color other than this. what a creative and lovely draw, poppa!! It really does belong on a wall! 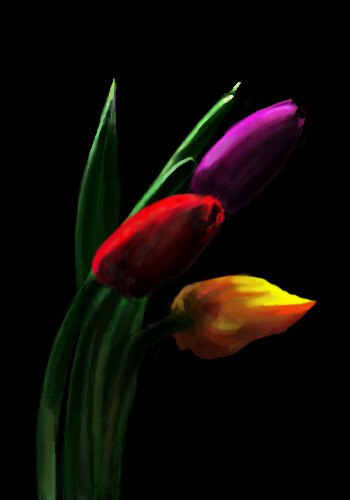 I have tulips already :). btw, I liked no's "really pops out at ya".. hehe.. Thanks..I liked the photo a lot...probably because of all the things you guys are saying here...I had to try drawing it. Pretty, my national flower :D. Spring is just around the corner and its making me happy! Really? ?Where do you live that you have that now? Beautiful contrast..crazy colors..Really like this, and it made me appreciate one of my least favorite type of flowers some more..
You don't like tulips?? Interesting... thanks.. I didn't comment? That's right I was going through my fugue. Well everyone's said it all I'll just say pweddy. Um...something about a banana split with a windmill in it? vibrant colours ! nice ! THanks Mal! Where ya been! Almost feels like they're neon coming off the black, beautiful! everything's been said. very beautiful! I don't know how I missed this one for so long.......MY GOD THIS IS BEAUTIFUL! I think I like it better than the ref. pic.